Jackson Family Farm is tucked behind the Jackson family home in the Spokane Valley. Driving through the neighborhood, you might mistake it for any other neat, well kept, single family home on the block. But step into the backyard, and you will find your self standing in a 1 1/2 acre diversified vegetable farm. Dan Jackson began farming nearly 15 years ago. He tried selling at farmers markets before settling on focusing on restaurant sales. In the summer, Dan delivers to area restaurants 5 days a week, rising early each morning to harvest his famous basil and heirloom tomatoes with a headlamp before heading off to his day job as a camera man for Krem 2 news. 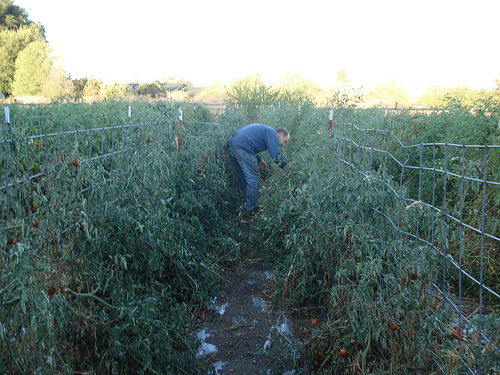 Dan Jackson, harvesting his famous heirloom tomatoes. When Joel and I first started formulating the idea of LINC, Dan was one of our early cheerleaders and we are very blessed to have him as part of our board of directors. When some of Dan's regular customers fell through earlier this year, LINC was able to help him out. "As happens every year, a couple of my customers either stopped buying or ordered a significant amount less. This leaves a small farmer, without access to wholesale markets, at the edge of success or failure in the middle of the season." Thankfully, we were able to move hundreds of pounds of Dan's tomatoes to local school districts and universities. You can find Dan's excellent produce everywhere from Mizuna to Tomato Street, and of course, any restaurant or institution that orders it through LINC Foods!